Good morning! Today, I’d like to share a very important event in the life of my family. 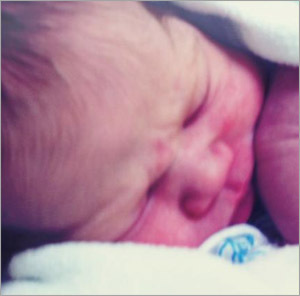 Last week, my daughter Brenda gave birth to my first grandchild, Aurora Zia. Aurora is Spanish for “dawn” and Zia means “sun” in the Navajo language. It was certainly a day of new beginnings and I wanted to share my happiness with you. I’ve attached a picture of Aurora Zia. Speaking of new beginnings, at MSU, our Bozeman campus has its own bright promise in the form of a new College of Business building. I want to give you an update on this exciting project, made possible by a generous donation from ’52 MSU alumnus Jake Jabs, president and CEO of American Furniture Warehouse in Denver and a native of Lodge Grass. Since the beginning of February, we’ve been meeting with students, faculty and staff to gather ideas on the design of classrooms and informal learning spaces; student support and work environments; faculty and research activities and the overall feel of the building for those who see it on campus and those who use it. Our ultimate goal is to build a modern facility containing state-of-the-art technologies to support student academic success, a building that will make us all proud and be a showpiece for the campus. An important part of this planning process is choosing a building site for the facility. With input from students, faculty and staff, the potential locations for the new College of Business building have been narrowed to three possible sites that you can see on the map below. 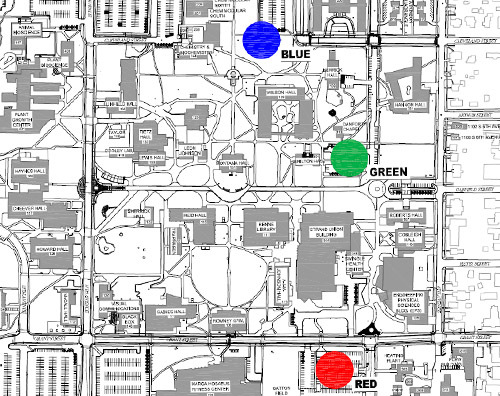 The three sites being considered are: Red (South of Grant Street); Green (near Hamilton Hall); Blue (North of Wilson Hall). Placing the new building on any of the three potential sites is consistent with our campus master plan. The College of Business Building Committee will compile a detailed list of strengths and weaknesses related to each of the sites for review by the University Facilities Planning Board and for my consideration in making the final site selection. An open session to gather additional campus input on the three possible building sites will be held noon to 1 p.m. on Thursday, March 8 in ballroom A of the Strand Union Building. I hope you take this opportunity to give your input on where this exciting new building will stand. We expect to have the final building site selected in April. Architectural programming, to identify the types and sizes of spaces, should be completed by May and schematic design, which begins to establish the actual building layout and appearance, should be completed by August 2012. The final construction drawings should be completed in March 2013 so that construction could begin immediately following the 2013 Montana Legislature. Final completion and occupancy is set for early 2015! Comments are encouraged on our MSU CoB page.